One can hardly find a person who does notI had a will umostitsya in a comfortable chair and feel the gentle swaying motion of the suspended structure. 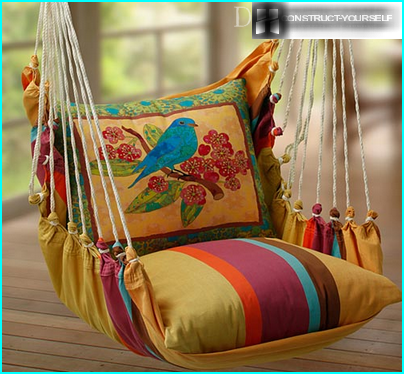 Convenient swings and hammocks at all times enjoyed great popularity. Today, the number of outboard seats considerably expanded: Suspended sofas and chairs adorn many suburban areas, easily fitting into the landscape design. The basis for the production of suspended seatsIt was the usual rocking chair. 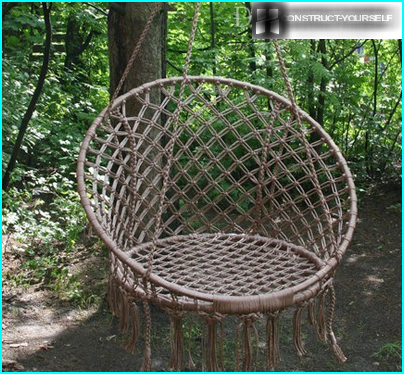 Wicker or rattan design of vines have become the most promising experiments for furniture because they weigh very little, but they have excellent strength. The semi-circular design are attractive because they allow you to evenly distribute the entire load. 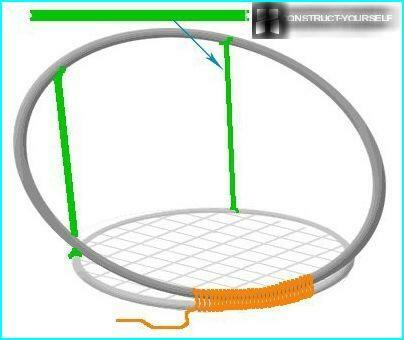 Furthermore, it is convenient to hang by placing the appliance in the uppermost point. suspended seat frame may have a few options. Instead of the traditional rattan vines or at registration suspended seats are increasingly used synthetic materials, thanks to which the structure becomes lighter, flexible and noiseless. The options, as you can see, a lot. We specifically analyze two examples. To build such a chair is not difficult. It is only necessary to possess a basic technique of weaving macramé. To make better use of seat arrangementwraps made of plastic pipes having a 35 mm cross section. 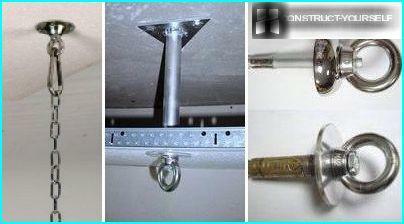 Plastic pipes have a thickness in the metal sheath and capable of providing sufficient strength suspended structure. To make the wrap of the pipe define the firstlength of the segment, using the formula S = 3,14hD, where S - the length of the tube, D - the required diameter of the hoop. 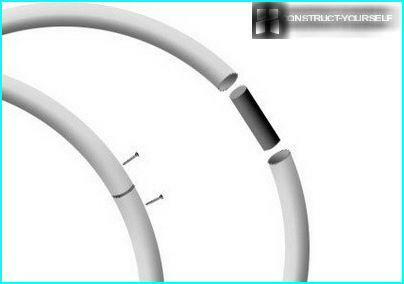 For example: to manufacture hoop D = 110 cm is necessary to measure 110h3,14 = 345 cm pipe. For weaving goes perfectly with polyamide cordpolypropylene core 4 mm thick, which can be purchased in a hardware store. 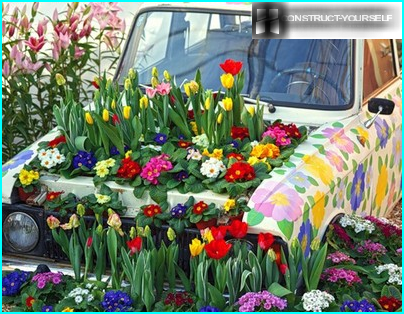 It is good in that it has a soft surface, but unlike the cotton fibers during mating able to create denser nodes that are not "raspolzutsya" during operation. To avoid differences in color and texture of the material, the entire volume of the cord, it is desirable to purchase immediately. Our task - to completely cover the metalsurface hoops. To make 1 meter thick hoop turns out about 40 meters cord. 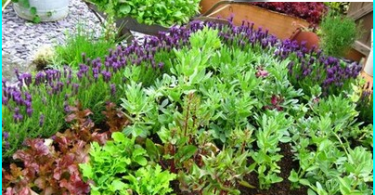 The turns do not hurry with good tension, imposing lead smoothly and accurately. To make a thicker winding, every20 turns do utjazhki, firmly twisting them in the direction of the winding up to the stop. As a result, we should get a smooth and dense surface of the braid. And yes, to protect hands from calluses, this work is best done with gloves. When you create a grid, you can use any vending pattern macrame technique. The easiest way to take as a basis "checkerboard" flat units. During weaving watch the power cord strain relief. On this will depend on the elasticity of the finished grid. The free ends of the nodes is not necessary to cut. Of them can form a fringe. Braided hoops collect into a single structure. To do this, from one end of the fastening them together with one winding cord. The length of the supporting rods can be any and is defined only by the selected backrest height. To prevent slipping hoops at the ends of the four wooden rods make shallow cuts. Driving back weaving can also be any. Weave start with the top of the backrest. Slowly sinking to the seat. When the pattern of braiding, yarn ends in a fixthe lower part of the back and make out their fringe. Strengthen the construction permit two thick cord that connects from the back seat. Fine suspension seat is ready. 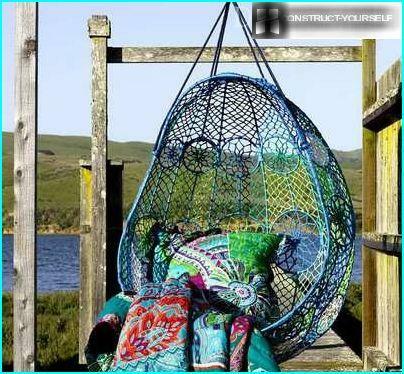 We can only attach a sling and hang the chair to the desired location. If you do not want to engage in weaving, or for some other reasons, the first option you did not come, it may be suitable here such. Sewing machine and the most necessary accessories dressmaker. 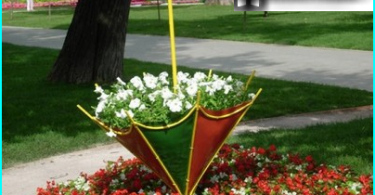 To manufacture the hoop can be of multilayerpipe, which is sold in the form of a rolled-bay, or from bent wood. But using wood should be prepared for the fact that under the influence of temperature drop hoop can quickly crack from dryness and deformed. Of the three-meter cut two equal kroimsquares, each measuring 1,5h1,5 meter. Each of the squares alone add up to four times. To make it a circle with a central angle of a radius of 65 cm outline the circle and cut it. By the same principle we do and cut out a circle from the other square. Each of the resulting circles, stepping back from the edges of 4 cm, the dashed line outline the inner loop. The planned openings for sling: Fold the circle four times and to iron it to the folds were landmarks. The first pair of sling is positioned relative to the bend at an angle of 450, The second - 300. Mark the corners of the slots under the seat for slings, again decompose both circles and iron. To do the same slots on both faces, connect a piece of fabric and pinned their pins. 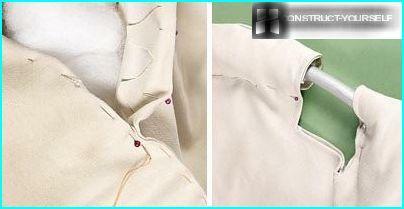 On the contour of the finished sections of the first circle make slits on the second fabric cutting. 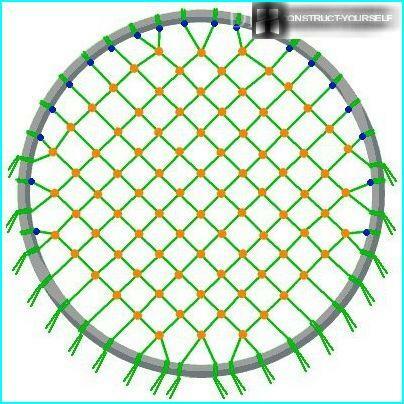 Grind both circles together and to target the dashed line, leaving an opening for the insertion of the hoop. Free allowance is cut teeth. Case Ready to turn out there and ironing. Stepping back from the edge of 5-7 cm, baste together the two sides. 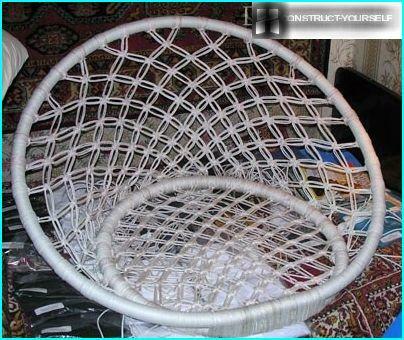 The edges of the holes left by the insertion of the hoop, turned inside out. 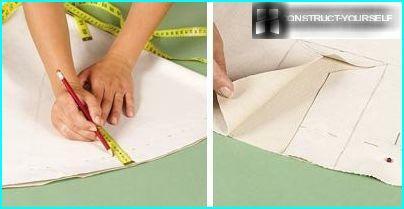 Fill the bag with synthetic padding, extending filler strip and locking their edges a hidden seam. 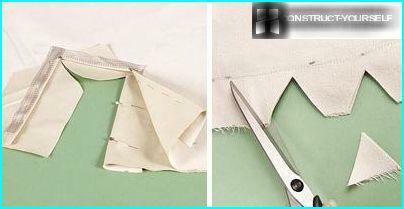 To strengthen the case on the hoop, in several places the stitching cloth. Mode sling four cutting length by 2 meters. 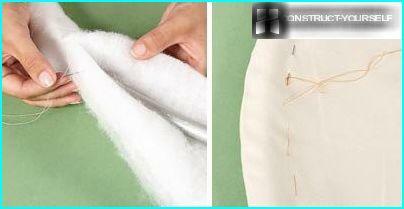 To prevent unraveling thread, melts the edge of the sling. 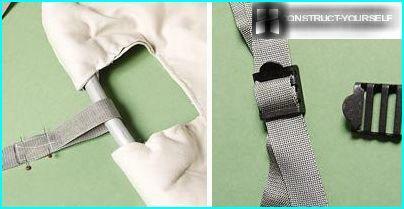 To be able to adjust the height and angle of the outboard seats, on the free ends of the sling dress buckle. All lines gather into one hanger, fixing on a metal ring. 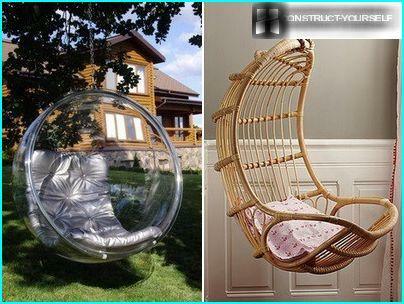 This chair can be placed in the garden, to the hangingthick branch of a large tree. 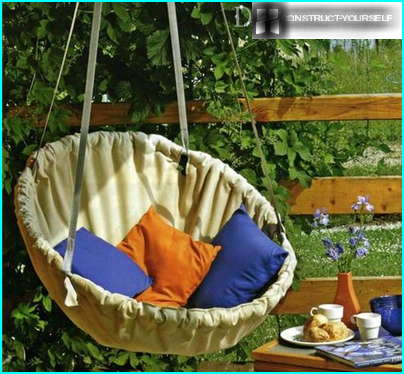 If you plan to make a hanging chair functional decoration porch or pergola, need to build a suspension structure. 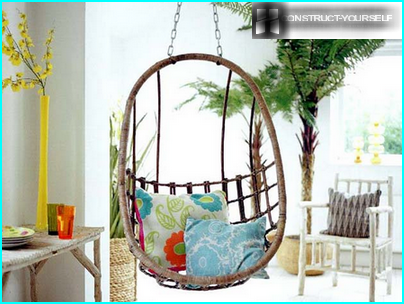 Suspension system must withstand not only the weight of the chair, but the weight of the person who sits on it. With this method of attachment should be considered the maximum load on the slab of the ceiling, which is measured in kg / m2Because this area will operate allsuspension system. If the load is less than the permissible weight, resulting in the calculation, it is necessary to distribute the load on the ceiling, erecting power rack that combines several anchors. Take a seat, and you get the perfectthe opportunity at any time to relax while enjoying a pleasant swaying motion, finding at the same time peace and a philosophical attitude to make things worse.